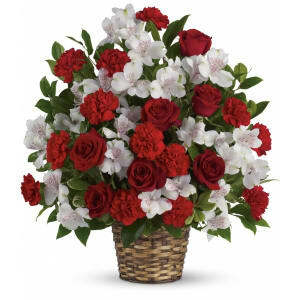 Reach out to the family at home with this lovely array of classic blooms artistically arranged in a beautifully woven basket. They'll be deeply touched. 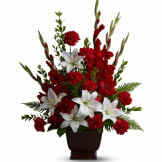 • This impressive bouquet includes red roses, red carnations, white alstroemeria, and accented with assorted greenery. 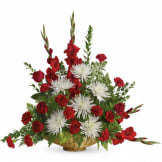 • An appropriate arrangement to be sent from family members, friends, or business associates. 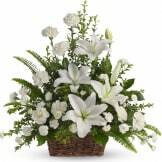 • Measures approximately: 20 1/2" W X 23" H.
Flowers will be received by a Chapel of the Chimes Funeral Home - Westland's staff. Beautiful arrangement, using a variety of colorful flowers. All of our flowers are designed and delivered by hand from a local florist in in Westland.